HomeThe Scrutiny of Public Spending: Margaret Hodge, Robert Chote, and Amyas Morse, amongst others, to discuss how Britain manages public money. We are organising a series of debates and discussions about how Britain manages public money. Getting and Spending public money is big business. Even after the current Coalition government’s austerity drive, public sending is forecast to be about 40% of GDP. (The long run average is just under 43%). Over the last half-century successive Governments have tried a number of reforms to the system for getting, planning, controlling and scrutinising public money. The latest two big reforms were the creation of multi-year Spending Reviews (SRs) by the New Labour government, continued (to the surprise of some) under the Conservative-Liberal Democrat coalition. And the very latest innovation is the creation of the Office for Budget Responsibility (OBR). The OBR now joins a constellation of institutions involved in managing public money – these include the Treasury itself of course, as well as the Treasury Select Committee (TSC), which monitors the work of the Treasury itself; the Public Accounts Committee (PAC) which monitors the probity, efficiency and effectiveness of public spending; and the National Audit Office (NAO). Internationally, other countries have also been innovating. The Congressional Budget Office (CBO) in the USA has widely been seen as an effective creation, and several other countries have followed suite creating Parliamentary Budget Offices (PBOs) and other oversight reforms of public spending. So – how well are our innovations (SRs and the OBR) and other institutions working? Do we need an overhaul of what what once memorably described as “the private government of public money”? Though it’s less private than it used to be, the way our public spe ding decisions are made are still far less transparent or consultative than in many other democracies. Is this a good thing, as some claim, or dysfunctional? We have also invited Andrew Tyrie MP, Chair of the TSC, but this not yet confirmed. We will be inviting others in due course. Watch for more details of these and other contributions which will appear here soon. ← SR 2013: Why now and what’s it for? Sounds really excellent. Please keep me informed. I’ll be 82 in May and a layman and so perhaps I should have more sense – but since you mention Aaron Wildavsky I am bound to say that I am still anxious to pursue his interest not simply in budgeting but also the quest to define an explicit “constituency dimension” within the government’s overall public expenditure planning. That is one potentially crucial area that has long required greater clarity in both national planning and in our central local relationships. 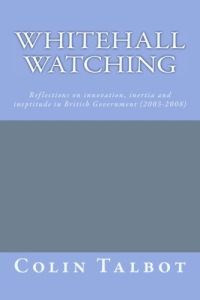 Again, from a systems perspective, there is also the abiding need to have some way of formally incorporating feedback into public expenditure planning – as indeed Normanton and others intended when they sought to replace the old Exchequer and Audit Department with the present National Audit Office. It must be said that our own Comptrollers have been reluctant to stray into this latter area without clear parliamentary direction. But it is an accepted practice in Germany and elsewhere – as well as a fundamental feature of systems design everywhere!